Marfa Public Radio is happy to announce the hire of its new Permian Basin reporter, Mitch Borden, who comes to Texas from Alaska Public Radio. Mitch is Marfa Public Radio’s first reporter position dedicated to the Permian Basin. Based in Midland, Mitch will cover major news developments in the region while also looking for the untold local stories that define the place. Mitch was born in Michigan and graduated from Northern Michigan University with a B.S. Art & Design in photography. Mitch first picked up a microphone as a radio producer at KNOM in Nome, Alaska. There he did everything from covering the Iditarod to hosting the morning music show. 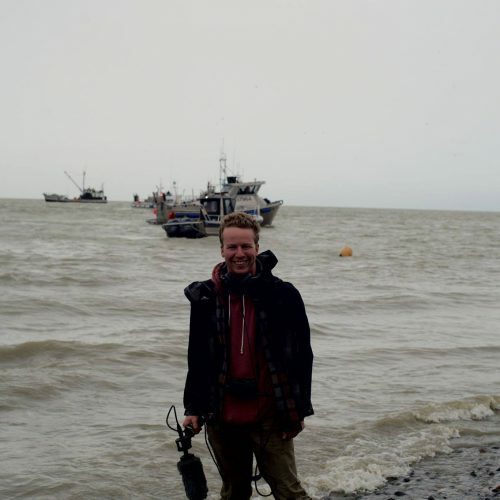 He subsequently trained at the Transom Storytelling Workshop and at the Salt Institute for Documentary Studies before returning to the 49th state to work as a reporter and producer at KMXT in Kodiak, and as a fisheries reporter for KDLG in Bristol Bay. Mitch also served as a producer for the hit podcast Midnight Oil for Alaska Public Radio and volunteered as a first responder for the community of Nome. Marfa Public Radio strives to connect West Texans to each other and to the world — from the region’s breaking stories that our news staff covers to the voices of West Texas that we celebrate. This position will make it possible for Marfa Public Radio to make the daily news and stories of the Permian Basin part of its award-winning coverage. This position is made possible through the generous support for public radio from the Midland philanthropic community: Permian Basin Area Foundation, FMH Foundation, Abell-Hanger Foundation, the Henry Foundation, and the Yarborough Foundation. The Marfa Public Radio Midland Fellowship is awarded to a journalist who shows promise in his or her career. It is a twelve-month opportunity to delve into and report on the stories that matter. Mitch may reached at mitch@marfapublicradio.org. This entry was posted in KRTS News, KXWT News. Bookmark the permalink.